Accurate and intelligent view of health of Application Services and Impact. 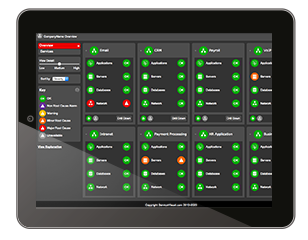 Visibility Provided via our easy to understand Stunning Dashboard technology – from your NOC or on your mobile device. Identify the root-cause of service degradation (network, server, application, database, storage etc) within a few clicks! Simple to read logical Dashboards complimented with Service Maps showing actual topology of the service. View service performance from the DC and Regional End User Perspectives. Dashboard and Service Model’s updated automatically in response to infrastructure changes. Key Services discovered and modeled by our experts, using our unique technology and processes. Delivered as A Managed Service from our Secure Data Centre. 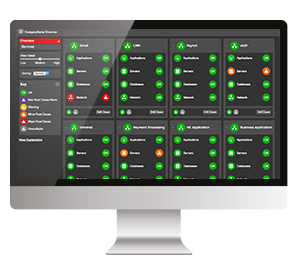 No need to integrate with or replace your existing monitoring tools – we compliment them. 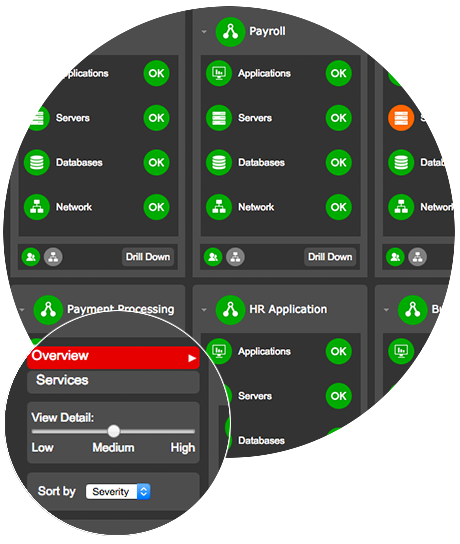 Intelligent “service-aware” alerting allowing users to easily prioritise work. Service Availability Reports, Daily, Weekly, Monthly. Allows IT to report on to the business in context of the key services it delivers and in a language the it understands.